I can also think it might be useful for narrow gauge. Rail is code 100, which can be filed down underneath to join onto code 60 rail. 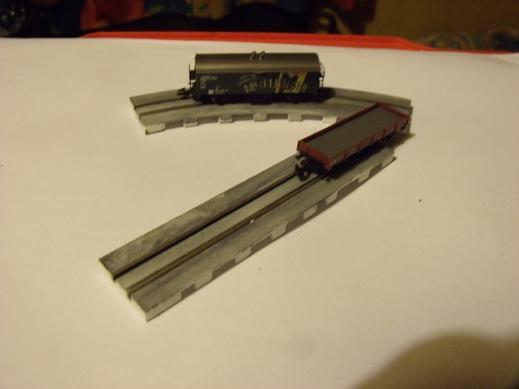 I am working on more track sections, and after a suggestion have made the sections 40mm wide with track down one side . Specifically aimed at Nm scale, but could be used for other scales. This also gives enough room for double track so there is also point sections and double track. I wasn't going to bother, but then saw film of the metre gauge passing loop in Castres. I am also testing out to see if finer rail, eg code 75 or code 83 can be fitted. Unfortunately the samples I have already, have had code 100 fitted so are worn down, The rail does still feel like it is clear of the road surface, but road surface can easily be sanded down if there is a problem. I don't want to modify the 3D printed designs though, as that will just complicate things.